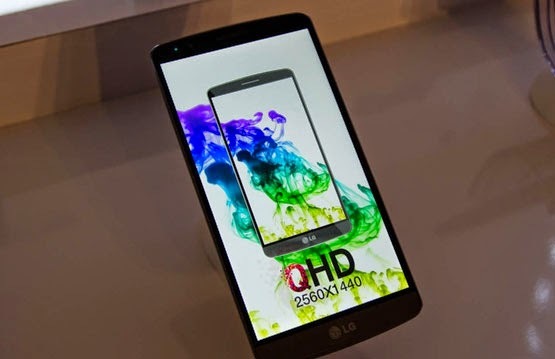 LG officially unveiled on Tuesday its latest flagship smartphone, the 5.5-inch LG G3. The G3's most distinguishing feature is its screen: It has a mind-blowing 2,560 x 1,440 resolution, which means its pixel density is a truly eye-popping 538 pixels per inch. To put that in perspective, that's the same resolution as a 27-inch iMac. 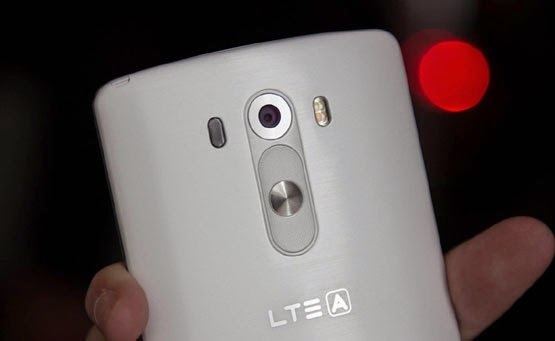 The LG G3 isn't the first phone with this high of a resolution, but it's the first mainstream smartphone. LG calls it "quad-HD," but that's a bit of a misnomer — this isn't a 4K display in a smartphone, but it's the highest resolution I've seen to date. The screen, which is an IPS LCD, is vivid and bright. Pixels and colors popped; watching 4K video clips, running through the applications, and taking and viewing photos all looked great. If I'm being honest, though, I'm not actually sure whether I could see more detail on the LG G3 than on other smartphones, or if it was the screen's size that made the difference. 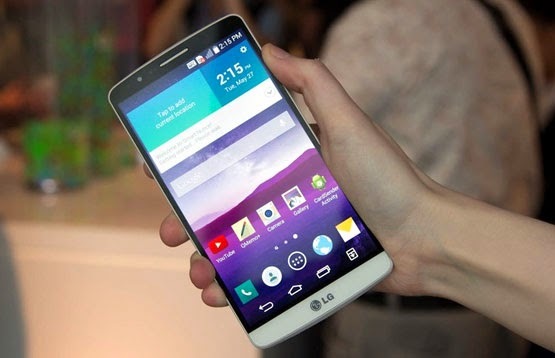 Make no mistake: The LG G3 is a large phone. LG did what it could to make the phone longer rather than wider to try to keep it more manageable, but it's still a big device. However, I found the phone's overall shape and size much more usable than last year's Optimus G Pro. Like the LG G3, the G Pro also had a 5.5-inch screen, but its bulkier body and larger bezel made it harder to hold. LG said the G3's dimensions are actually closer to the average 5-inch phone, rather than the 5.5- and 5.75-inch varieties, but it's still big. When holding the device with two hands, its size might not be a problem. Holding it up to an ear, however, is a challenge. As with the LG G2, the G3 has buttons on the back of the phone for your finger. I think this is smart placement, but I frequently forgot where the buttons were whenever I wanted to adjust the volume or another toggle. Beyond its sheer size, the G3's design and shape is well done; it's LG's sleekest smartphone yet. The subtle curve on the back feels good in the hand. The phone is also much lighter than I expected it to be, especially given its size. From a build perspective, I would place the G3 behind the HTC One M8, but ahead of Samsung's Galaxy S5. The back is removable, as is the 3,000 mAh battery; this is nice because it means you can customize the phone with various colors for more personalization. The LG G3 has the standard specs of most other flagship Android phones: a quad-core Snapdragon processor (this one is an 801 with an Adreno 330 GPU) and 2GB of RAM. This is the standard configuration for basically every high-end Android phone these days — that's why the screen is such an important differentiator. Using the phone, I didn't notice any slowdown or stutter. It kept up with everything I was doing, and worked with tons of apps running in the background. Of course, it's hard to do a real speed test in a brief hands-on, but the G3 is definitely a quick phone. LG is making a big deal about the 13-megapixel camera in the G3, not so much for the sensor, but for the added features. The camera has something called "Laser" autofocus, which is supposed to focus faster than ever. The sensor on the front-facing 2.1-megapixel camera is larger, too. I couldn't judge the autofocus' abilities at length in my hands-on time, but my tests show that the focus was quick. I also really like the interface of the focus. When it comes to interfacing with the camera, LG has two options: The first is to tap on focal points, and watch the camera take the shot automatically; the second is to tap to focus, and then hit the shutter button. I like having both options, as sometimes the autofocus is absolutely correct, while other times, I want to have control over when I hit the shutter. The front-facing camera looked good. The room I was in was lit with natural light — normally a disaster for front-facing cameras — but the image came in bright and clear. LG has also put more microphones on the G3, which is supposed to improve video and audio quality. I wasn't able to really test that, but I took video in both 4K and 1080p, and playback was smooth in both resolutions. One of the best decisions LG made with the G3 was to tone down how much it skinned Android 4.4.2 KitKat. This isn't a pure Android experience, but LG has modified its launcher and UI skin to align closely with the KitKat motif; that means flat icons and more Halo-styled menus and toggles. I'm usually not a big fan of Android UI skins, but I like a lot of the changes LG made to the G3. Viewing all open windows shows multiple app screens in a grid, instead of a scrolling list. I also like the transitions on some of the custom home-screen widgets. The only confusing thing: figuring out how to add another page to the home screen. LG has also put a lot of effort into the keyboard. Like other phone and keyboard makers, LG's keyboard on the G3 will learn your typing patterns, and adjust the target zone for a key based on your usage. So, if you frequently type "A" when you actually want to press "S" key, the keyboard will compensate for that. As I said, this feature is quite common on most smartphone keyboards, but it's still nice to see. 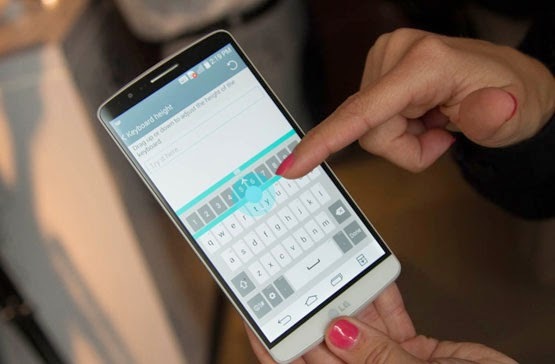 You can also adjust the height of the keyboard; this is good for users who want to see bigger keys, or those who might have a different kind of finger reach. My favorite feature is the ability to add custom keys to the keyboard: If there's a symbol or emoji you frequently like to insert, you can make that into a key, and add it to your keyboard. LG has also brought back its Knock Code for the G3, which lets lets you "knock to unlock" the phone. You do this by tapping in a pattern on the device. The nice thing is that the pattern is arranged in quadrants, so as long as you tap anywhere in the quadrant, you can unlock the phone. The Knock Code worked extremely well in our tests; that may not seem like a big deal, but it is. Most of the time, these types of unlock mechanisms — Touch ID notwithstanding — tend to require very precise usage. Personally, I prefer Knock Codes over entering in a four- or eight-digit code, or a picture password. I didn't try out the fingerprint sensor on the LG G3, but there's one on the back. The LG G3 will begin rolling out on May 28, but isn't expected to hit the U.S. until later this summer. I look forward to testing the phone, and comparing its camera flash and various features against other Android flagship phones. As a first impression, I think this is LG's best smartphone effort yet. The design is an improvement, the UI and UX are attractive, and the specs are impressive.